Are you relocating to the Jamaica? We can help! Relocating overseas can be a stressful time, especially if you’re moving as far away as the Jamaica. 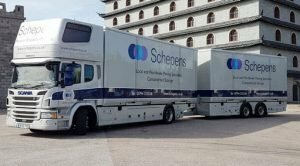 At Schepens, we aim to help make every move as simple and stress-free as possible by helping with every step of your move – from planning and packing to shipping, delivery and storage on arrival. We have a great deal of experience and knowledge in removals to the Jamaica, ensuring that your shipping will arrive on time and securely at your destination. HOW LONG DOES SHIPPING PERSONAL BELONGINGS TO JAMAICA TAKE? Our aim is to synchronise the arrival of your goods and furniture with the day that you move to your new home on the island. We ship regularly to Jamaica so we’re able to be flexible when offering shipping dates. We can also offer clients a choice of sole use, or shared containers to ship their goods. Sole use containers take 3-5 weeks to arrive, and shared containers take 6-10. Rio Bueno, Lucea, Baptist, Osborne Store, Portmore, Hayes, Kingston and Linstead. IF YOU’RE MOVING TO JAMAICA, THEN SCHEPENS HAS THE EXPERIENCE, EXPERTISE AND LOCAL KNOWLEDGE TO OFFER YOU A SMOOTH, TROUBLE-FREE MOVE. Jamaica is a popular destination for retirees and families from the UK, and no wonder. As a commonwealth, anglophone country there’s a lot that’s familiar about it. Then there’s the sunshine, the music, the beaches and the exceptionally friendly people. Jamaica covers 4,111 square miles and has just 2.8 million inhabitants – which leaves a large slice of paradise for expats. Speak to us today on 01794 323558 for a no obligation removals quote on your move to Jamaica. Kingston is the island’s capital city and it’s larger than you might imagine. Around a fifth of the population live there and it’s known for its food, its music (of course) and its cosmopolitan culture. You may find yourself opting instead for the quieter Portmore, just 15 km from the capital. There’s also Jamaica’s historic capital, St Andrew, offering historic architecture and a stunning mountainside location. If you’re moving to Jamaica for work, a new start, or you’re looking forward to retire there, you’ll welcome the support of an experienced international removals company with local knowledge. Schepens has been helping people to move since 1911, so we’ve had plenty of time to learn the business! We’re a 4th generation, family-run business with an excellent track record when it comes to international removals. Moving to Jamaica from UK is a big project, which is why we allocate our clients with a dedicated Move Co-ordinator. Your co-ordinator will have knowledge of the location and experience in removals to Jamaica. Together you’ll create a ‘Removals Plan’ detailing all the services you will need, and deadlines that will have to be hit for a successful move. A move to Jamaica is a radical change in lifestyle. Many of our clients decide to leave some of their furniture and goods in UK storage. Schepens can arrange for a door-to-door storage service should you require it. Our storage facilities feature 24 hour security, controlled and maintained humidity and temperature, and easy access to your container throughout the week. As a UK citizen, you don’t need a visa to travel to Jamaica. On arrival your passport will be stamped with a date 3 months hence. This is the length of time visitors are allowed to stay. To apply for permanent residence you will need to demonstrate that you intend to retire to the country, that you have permanent employment, are married to a Jamaican, or that you are financially independent. There are between 30-40 public hospitals in Jamaica offering free healthcare and medical services to the country’s residents and citizens. Expats are advised, however, to take out private health insurance as the quality free healthcare can be patchy. Some severe health conditions cannot be treated on the island, so insurance should also cover the need for emergency evacuation. One thing that will seem familiar in Jamaica is education, as it’s based on the British system. The Ministry of Education administers around 1,000 Jamaican schools. As with any education provision there is no uniformity of standard. The top schools, though, such as Ardenne, Glenmuir, Immaculate Conception and Campion College are ranked extremely high in terms of global educational achievement. Packing – our BAR trained professional packing teams could save you a good deal of time and stress. Every Schepens packer understands the importance of high quality packing materials and techniques, detailed labelling of boxes, and an accurate inventory. Should you wish to pack for yourself, we will provide professional packing materials. Non-Standard Items – Schepens are specialists when it comes to shipping valuable antiques, musical instruments, or art works. For non-standard items, we create a bespoke shipping process, and arrange appropriate insurance cover. Insurance – we insure all goods in transit for our clients’ peace of mind. We can also arrange additional insurance policies covering accidental damage and extended liability. Storage – Should you wish to place any of your goods in storage, we can arrange a door-to-door service. We will deliver your container, seal it when packed, and transport it to one of our secure storage facilities. Removals Fleet – Your goods will be shipped in one of our state-of-the-art RoadTrain removals vehicles which maintain a constant temperature and humidity, run on air ride suspension and boast an adjustable bearing system, which ensures little or no movement of vehicle content. Throughout the past 100 years of removals services our goal has been to reduce the stress of moving for our clients. When it comes to international removals, we understand that the stakes are high. We are proud of our flawless reputation for successful removals to Jamaica and every single member of the Schepens team works exceptionally hard to maintain it, with every single client. Schepens specialise in removals to all major towns and cities in the Jamaica, including: Rio Bueno, Lucea, Baptist, Osborne Store, Portmore, Hayes, Kingston and Linstead. Let Schepens take the stress out of international removals to Jamaica for you. Call us today on 01794 323558 find out how we can support your move.